You’ve prayed about it a lot and you feel like God is calling you to start a prayer group. You’re willing to do it, but, when you’re being honest, the idea kind of terrifies you, or at the very least intimidates you. Where should you start? What would you even talk about at the meetings? Great job, you’re already asking the right questions! This post will give you the tools you need to skip the time-consuming learning curve and get straight to the fun. Over the years, people have put a lot of time and energy into creating prayer group plans you can follow. Many of them have workbooks and videos, so all you have to do is follow the well-laid-out plan and you’ve got yourself a prayer group. These study plans usually fall into two major categories, instructional and relational. Instructional studies are more focused on teaching about the facts of our Christian faith. The foundations and interesting history tidbits that draw it all together and make prayer and reading the Bible that much richer and more fruitful. Relational studies, on the other hand, focus more on your relationship with Jesus. You learn about who Jesus is as a person (and God), who you are, and how a relationship of mutual love and respect for Jesus can grow into greater freedom and a happier life. With relational studies, you often learn to sit before Jesus in silent prayer or how to dig into the Bible to get a new insight into who Jesus really is so you can start recognizing Him in your daily life and feel that friendship with Jesus grow. The premise of this study is that God has called us all to unique and important roles in helping others in our life. Just as God has called us, He has also given us the gifts we will need to complete this calling. The idea is that, if we figure out how we’ve been gifted by God, it’s a clue to what He might be calling us to do in our lives. Sherry Weddell and Father Michael Sweeney have put together this study with a few workbooks and a CD that make it an easy prayer group to lead. The study starts with a “Gifts Inventory.” Each person takes this paper and pencil questionnaire with over 100 questions. It gives them five gifts, called charisms, as a starting point. From there, the study walks everyone through choosing one charism to learn more about and ways to figure out if it’s truly a gift God has given you to serve others. Everyone is called. Everyone is gifted. This is a two-part study. Our group chose to meet every other week, coinciding with the school year, for the first part. We took a break over summer and then did the second part of the study in the fall. That seemed to work well for us. In order to lead this study, Called and Gifted does offer trainings throughout the country. Click here to find a study near you. If you can’t make one of their trainings, they do have a recorded version available. This study is based on the Spiritual Exercises written by St. Ignatius of Loyola in the year 1522. It is adapted for our day and age by Carol and John Weiler and Father Marty Gleeson. These exercises walk you deeper and deeper into an intimate relationship with Jesus. This study is intense and not for the faint of heart, but if you put the time into it your life will be changed. The course is divided into three main parts. The study gives you a guided prayer time for each day and you meet once a week to do “faith sharing.” During the meetings, each person shares what they learned, struggled with or felt Jesus was telling them throughout their week of prayer. I half-jokingly call this the introverts prayer group because of the way the faith sharing is set up. Each person has a chance to share if they want to, but they don’t have to. You are not allowed to comment on what other people say but only share your own experience. So while you are going through this together you are doing a lot of listening and learning from each other without the pressure of knowing what to say in return. While this comes as a very guided study that walks you through each step of the way, there are no videos to watch. You lead the meetings as a fellow “prayer” alongside the others. This group does require special training from the author Carol Weiler, her husband John, and Father Marty Gleeson. They travel throughout the United States offering these training and may, at some point, hopefully be offering a Skype option. Click here to find a training near you. SOUL is an acronym you use to help you read through the Bible verses. With this study, you read the verses you will be hearing at church the upcoming Sunday slowly and intentionally, paying attention to words or phrases God is pulling your attention to. Then you ponder how they apply to what’s going on in your life right now. This is a rich way to become acquainted with the verses so when you hear them at church they are like old friends. It can enhance your takeaway from the sermon or homily, because you have the good foundation in the Scripture that inspired it. With SOUL you meet Sunday after church or some time early in the week to share what you’ve taken both from your time alone with the Bible verses that week and also from church. Full disclosure, I wrote this study. My prayer group has really liked it and consistently requests to have it as our study. We’ve done SOUL for big hunks of time and also as a filler between larger studies if we want to keep meeting but we’re not ready to dive deep into something new yet. To lead SOUL, you do want to be comfortable leading a group and guiding conversation while still remaining open to where the Holy Spirit wants to take you. Because of this, it might not be a great starting point if you’re new to leading prayer groups. This is the first prayer group I ever led and truly a great place for beginners to start. There is a workbook and videos. You just have to be willing to get up in front of your group to lead. Other than that, they hold your hand and guide you through the whole process. While this is a very Catholic study, it’s good for anyone who wants to learn more about the Catholic faith. When I did this study locally, we had everyone from non-Catholics to women in their 80’s who were born into the Catholic faith take the study. We all learned something. With this study, I saw women’s faith be re-ignited in life-changing ways. Since this course is instructional in nature, it gives a history and background of why Catholics believe what we do. It also goes deep into the reasoning behind many of our ancient traditions and rituals making it all come alive in a way that feels real, like you’re there with the early disciples. This study does come with a hefty amount of weekly homework. There was some feedback from our group that the homework got to be a bit overwhelming. We invited everyone to come whether or not they got their homework done, but of course as with anything, the more time they put into it the more fruits they seemed to get out of the study. This study is so rich that when we met, we never seemed to have enough time to get to everything we wanted to discuss. If I were to do it again, we would split each week’s homework in half, covering just one half of each chapter every time we met. Both instructional and relational studies are, of course, wonderful in their own way. They appeal to people differently at certain times in their life. For your first group, I’d recommend doing whatever sounds most intriguing to you. Once you finish the first study, you can think about what you liked and didn’t like about it. It’s also good to send out a quick survey to get a feel for what your group liked or didn’t like. This can help guide you as you choose the next study to do. For example, with Women of Grace, on the survey my group told me they needed less homework. Over time, you will find your niche and the type of groups you like to lead. You will also naturally attract the type of people to your group who enjoy doing those kinds of studies. You can do this. Lots of women have before you and by getting the right tools here you’ll have a head start, so you can skip the time-consuming learning curve and get straight to the prayer. As I find new studies, I will continue to add to this list over time. Please take a moment to bookmark this page so you can reference it in the future. If you have a study you think would be a great fit for this list, please email us the information at: alifeofprayer.com@gmail.com. 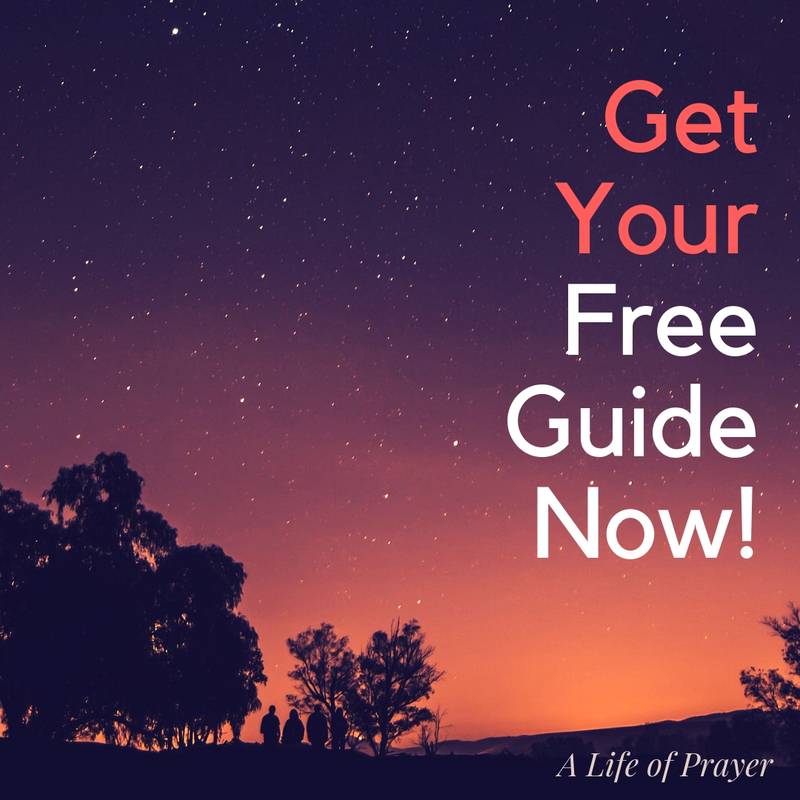 Get this Simple Guide to See How the Bible Connects with Your Life Right Now. How to pick up the Bible and start to hear God’s voice! We won’t send you spam. We may send you weekly tips on how to hear God’s voice. Unsubscribe at any time.